Laboratorio de Productos Naturales, Departamento de Química, Facultad de Ciencias Básicas, Universidad de Antofagasta, Casilla 170, Antofagasta, Chile. The antioxidant properties oí Acantholippia deserticola, a herb used in traditional northern Chilean medicine was studied using free radical - generating systems. The 50% aqueous - ethanol extract oí Acantholippia deserticola protected against non-enzymatic lipid peroxidation in microsomal membranes of rat, induced by an Fe++ - ascorbate system and measured spectrophotometrically by the TBARS test, and had strong free radical scavenging capacities on stable ABTS and DPPH radicáis. 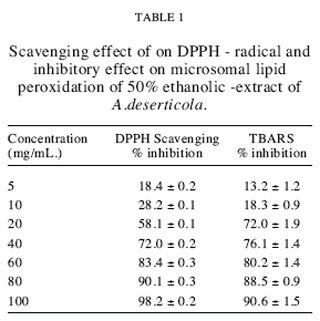 The results shows that the IC50 valué of the 50% aqueous - ethanolic extract oí A.deserticola is 18 ± 0.5 μg/mL in DPPH radical - scavenging, 15 ± 0.8 μg/mL in lipid peroxidation , Total Antioxidant Activity (TAA) is 0.95 mM of Trolox per mg/mL of extract. The total phenolics content of extract is 725 ± 12 mg of gallic acid equivalent per g of dried extract. The results indicate that the 50% aqueous - ethanol extract oí Acantholippia deserticola clearly has antioxidant properties. Key terms: Acantholippia deserticola, northern Chilean medicinal plant, phenolics, free radicáis scavenging, microsomal lipid peroxidation. The "Puna atacameña" is located approximately 250-300 km to the northeast of city of Antofagasta in northern Chile, near the borders with Bolivia and Argentina. The área is a particular biotope, characterized by varying altitudes of between approximately 3,000 and 4,200 meters above sea level (1). The Atacama Desert is one of the driest and most hostile environments in the world. Around 5,000 people Uve in this peculiar ecological system (2). The inhabitants of the "Puna atacameña" must support not only climatic inclemency, but also remarkable isolation due the great distances that sepárate them from urban centers - more than 200 Km of distance. This explains the great knowledge about and the intense use of medicinal herbs, which are still an important and essential part of everyday life (3-6). It is generally accepted that free radicáis play an important role in the development of tissue damage in various human diseases, such as cáncer, aging, neurodegenerative disease, and atherosclerosis (7). There is increasing interest in the natural antioxidants contained in medicinal plants, which are candidates for the prevention of oxidative damage (8-9). Acantholippia deserticola. Phil (Verbenaceae), commonly known as rica-rica, is a small bush, with a height of 30-60 cm, that grows in the "Puna atacameña" in northern Chile. This plant is regularly sold in markets and herbal health stores. The infusión of the aerial parts has long been used in herbal medicine for diarrhea, gastrointestinal bloating, dyspepsia, treating liver disorders, and digestive complaints (lack of appetite, feeling of distensión or flatulence) (10). The infusión is prepared by boiling a small branch in 200 mL of water that is drunk three times a day until the sickness disappears (11). The aims of this work was to estimate the phenolic content and to evalúate the antioxidant activity of 50% ethanol extract from aerial parts of Acantholippia deserticola. Its antioxidant activities were also compared to well known natural antioxidants, such as quercetin and gallic acid. ABTS (2,2'-azino bis (3-ethylbenzothiazoline-6-sulfonic acid), diammonium salt, DPPH (1,1- diphenyl-2-picrylhydrazyl), (TBA) thiobarbituric acid, Folin-Ciocalteu reagent, quercetin, Trolox (6-hydroxy-2,5,7,8- tetramethylchroman -2 carboxylic acid), potassium persulfate and gallic acid were purchased from Sigma Chemical Co. All other chemicals and solvents used were of analytical grade. Leaves and aerial parts of Acantholippia deserticola Phil. were collected at Socaire, in northern Chile (23° 36'40 s S ; 67° 50'33 s W , 3230 m above sea level). The material was identified by Professor Clodomiro Marticorena, Faculty of Biological Sciences and Natural Resources of the Universidad de Concepción, and voucher specimens are kept at the Herbarium of Universidad de Concepción, Chile. The air-dried leaves of Acantholippia deserticola (1.2 Kg) were chopped and exhaustively extracted with EtOH: H20 (1:1, 10 L) for one week at room temperature. The EtOH:H20 extract was then filtered, evaporated under reduced pressure and freeze - dried to obtain a viscous mass of dark green extract. The yield of the lyophilized aqueous-ethanol solution was 145 g. Aliquot of the extract was solubilized in ethanol to a final concentration of 1.0 mg/mL. The antiradical activity of quercetin as positive control was determined using the stable 1,1 '-diphenyl-2-picrylhydrazyl (DPPH) (12-14). The quenching of free radicáis by A.punensis lyophilized EtOH:H20 extract was evaluated spectrophotometrically at 515 nm against the absorbance of the DPPH radical. A sample stock solution (1.0 mg/mL) was diluted to final concentrations of 100, 80, 60, 40, 20, 10 and 5 mg/mL, in ethanol. A DPPH solution (0.025 g/L in ethanol) of 1.5 mL was prepared daily prepared and added to 2.5 mL of sample solutions of different concentrations. The mixture was shaken vigorously and allowed to stand at room temperature for 30 min. Then absorbance at 515 nm was measured. The percentage of inhibition or percentage of decolouration was calculated as follows: % Inhibition = A (blank) -A (sample) / A (blank) X 100. Lower absorbance of the reaction mixture indicated higher free radical scavenging activity. The concentration required for 50% scavenging of the DPPH free radical (IC50) was calculated from the corresponding log-dose inhibition curve. Blank consisted of 2.5 mL of extract solution with 1.5 mL of ethanol. DPPH solution (1.5 mL; 0.025 mg/mL) plus 2.5 mL of ethanol was used as a negative control. Quercetin and Trolox were used as positive controls in the test. All experiments were carried out in triplícate. The ABTS"1" catión radical was produced by the reaction between 7mM ABTS in H20 and 2.45 mM potassium persulfate, stored in the dark at room temperature for 12 h. The ABTS"1" solution was then diluted with phosphate buffer saline (PBS) (pH 7.4) to an absorbance of 0.70 at 734 nm and equilibrated at 25 °C. The reaction was initiated by the addition of 1 mL of diluted ABTS to 10 μL of aqueous - ethanolic extract of A.deserticola in ethanol, at concentration of 1 mg/mL. The A reading was taken at 15 min of reaction. Total Antioxidant Activity (TAA) was determined using the standard curve of 6-hydroxy-2,5,7,8- tetramethylchroman -2 carboxylic acid (0-15 μg/mL) (Trolox) (R2= 0.9986) . The means of three valúes were obtained is expressed as mM of Trolox equivalent per 1 mg/mL of extract (15-17). Male albino Wistar rats weighing (150-200 g) were procured from Bioterio of the Universidad de Antofagasta and used throughout the experiment. The animáis were housed in an air-conditioned room (20 ± 2 °C) with light and dark cycles of 10 and 14 h respectively for one week before the experiment. Animáis were provided with rodent diet and tap water ad libitum. Animáis were sacrificed by cervical dislocation. The livers were quickly removed and perfused immediately with ice-cold 0.9 % NaCl to remove the blood. Whole liver was taken out and visible clots were removed and a weighed amount of liver was processed to obtaijn 10% homogenate in cold phosphate buffer (0.1 M, pH 7.4) using a glass Teflon homogeniser. The homogenate was centrifuged at 12 000 g for 30 min at 4°C and the supernatant was recentrifuged at 105 000 g for 75 min at 4°C. The microsomal pellet obtained was first washed and then diluted in Tris-HCl buffer (50 mM, pH 7.4) and 150 mM KC1 to a final concentration equivalent to 0.9 ± 0.1 mg microsomal proteins/mL . The lipid peroxidation was done by the method described by Ahmed et al., (18) and Arty et al., (19). The ascorbic acid solution and ferrous sulphate solution had been prepared just before the incubation was started. S ampie stock solution (1.0 mg/mL) was diluted in methanol to final concentrations of 100, 80, 60, 40, 20, 10 and 5 μg/mLof the incubation mixture. After pre-incubation of the mixture, consisting of 1 825 μLTris-HCl buffer (50 mM, pH 7.4), 1000 μLmicrosome, 75 μLextract solution and 100 \ih (lOOmM)ascorbic acid in incubation tubes for 30 min at 37 °C, the reaction was started by adding ferrous sulphate giving lOmM final concentration (t = 0). S ampies of 300 μL were taken out from the incubation mixture at 30 min and the reaction was stopped directly by adding 300 μL of incubation mixture into 2 mL of ice cold solution of TBA in TCA (4.16 mg / mL) - BTH in ethanol (1.5 mg / mL) (ratio 10:1) in glass incubation tubes. Then the reaction mixtures were first heated for 15 min at 80°C and then chilled on ice. The denatured proteins were separated from the mixture by centrifugation at 3000 rpm for 15 min at 4°C. The absorbance of the supernatant was measured at 535 nm against a blank reagent. The antioxidant activity of the extract of A.deserticola was expressed as an IC50 valué, i.e. the concentration in μg/mL that inhibits TBARS formation by 50% , and was calculated from the corresponding log-dose inhibition curve (20). Trolox and quercetin were used as positive controls in microsomal lipid peroxidation assay. Experiments were done in triplícate. Total phenolic content was determined according to the Folin-Ciocalteu methods , using gallic acid as a standard. 1 mL of 50% methanolic extract solution (1 mg/mL) was mixed with 1 mL of 50% Folin -Ciocalteu reagent (21-22). The mixture was shaken vigorously and allowed to stand at room temperature for 5 min before the addition of 2 mL of 20% Na2C03 solution. The mixture was centrifuged at 1200 g for 5 min after 10 min of incubation at room temperature. Then the absorbance of the supernatant was measured at 730 nm. The means of three valúes were obtained, expressed as gallic acid equivalent in milligram per gram extract. Antioxidant activity of Acantholippia deserticola 50% ethanol - extract has been found by means of free radical scavenging assays (DPPH and ABTS tests) and lipid peroxidation. In addition, Acantholippia deserticola 50% ethanol - extract shows high phenolic content. The results of this study clearly show that Acantholippia deserticola has excellent antioxidant activity. 1 ,l'-diphenyl-2-picrylhydrazyl (DPPH) reactivity is one popular method for screening the free radical-scavenging ability of compounds or the antioxidant activity of plant extracts, and has been used extensively as a free radical to evalúate reducing substances. The use of DPPH provides an easy and rapid way to evalúate antioxidants. DPPH is a free radical, stable at room temperature, which produces a purple solution in ethanol. It is reduced in the presence of an antioxidant molecule, giving rise to uncoloured or yellow ethanol solutions. The effect of antioxidant on DPPH radical scavenging was thought to be due to their hydrogen donanting ability. DPPH is a stable free radical and accepts an electrón or hydrogen radical to become a stable diamagnetic molecule. Table 1 shows the dose - response valúes for DPPH radical-scavenging of the 50% aqueous-ethanolic extract oí A.deserticola and the IC50 valué was found to be 18 ± 0.5 μg/mL. This IC50 valué of A.deserticola extract is higher than of Polygonum aviculare L. extract (50 ug/mL) (13), and is similar to that of Uncaria tomentosa (18 μg/mL) (23). IC50 valué for quercetin was found to be 0.87±0.06 μg/mL. These results imply that the aqueous-ethanolic extract of A.deserticola show high radical scavenging activity and may be attributed to its stronger proton-donanting abilities. Table 1 shows that the 50% aqueous ethanolic extract of A.deserticola inhibited FeS04 - ascorbate induced lipid peroxidation in a dose dependent manner. The decrease in the MDA level with the increase in the concentration of the extract indicates the role of the extract as an antioxidant. The suppressive effect on the lipid peroxidation was significant. IC50 valué was found to be 15 ± 0.8 μg/mLThis result indicates that A.deserticola extract is a good source of lipid peroxidation scavenging. IC50 valué for quercetin was found to be 10.3 ±0.6 μg/ mL. Using the standard curve of 6-hydroxy-2,5,7,8- tetramethylchroman -2 carboxylic acid (Trolox) on ABTS (R2= 0.9986) it shown that the Total Antioxidant Activity (TAA) of 50 % ethanol-extract from A.deserticola was 0.95 mM of Trolox per mg/mL of extract . Phenols are very important plants constituents with múltiple biological functions, including antioxidant activity because of their radical scavenging ability due to their OH groups. Total phenolic compound content of 50% aqueous-ethanolic extract oí A.deserticola was 725 ± 12 mg of gallic acid equivalent per g of dried extract. The result showed that A.deserticola extract contained a higher amount of phenolics than the extract of Polygonum aviculare (677 ± 62.7 mg of gallic acid equivalent per g of dried extract) based on Folin - Ciocalteu procedures. It has been reported that there is an inverse relationship between antioxidative status and incidence of human diseases. The research to identify antioxidative compounds is an important issue. Although it remains unclear which of the components of medicinal plants are the active compounds, polyphenols have received increasing attention recently because of some interesting new findings regarding their biological activities. From the pharmacological and therapeutic point of view, the antioxidant properties of polyphenols, such as scavenging free radicáis and inhibition of lipid peroxidation, are the most crucial. We are grateful to Prof. Clodomiro Marticorena, Universidad de Concepción (Chile), for the botanical classification of the plant material. This work was supported by Fondecyt (grant N° 1040294). Corresponding Author: Dr. Glauco Morales Laboratorio de Productos Naturales, Departamento de Química, Facultad de Ciencias Básicas, Universidad de Antofagasta, Casilla 170, Antofagasta, Chile, Tel: 56-55- 637812, E-mail: gmorales@uantof.cl. Received: December 6, 2007. In Revised form: April 25, 2008. Accepted: May 30, 2008.